Consolidated Financial Statements. The outcomes of these matters will generally not be known for prolonged periods of time. In certain of the legal proceedings, the claimants seek damages, as well as other compensatory and equitable relief, that could result in the payment of significant claims and settlements and/or the imposition of injunctions or other equitable relief. For legal matters for which management has sufficient information to reasonably estimate our future obligations, a liability representing management's best estimate of the probable loss, or the minimum of the range of probable losses when a best estimate within the range is not known, for the resolution of these legal matters is recorded. The estimates are based on consultation with legal counsel, previous settlement experience and settlement strategies. If actual outcomes are less favorable than those projected by management, additional expense may be incurred, which could unfavorably affect future operating results. We are currently self-insured for product liability-related claims and expenses. The ultimate cost to us with respect to product liability claims could be materially different than the amount of the current estimates and accruals and could have a material adverse effect on our financial position, results of operations and cash flows. 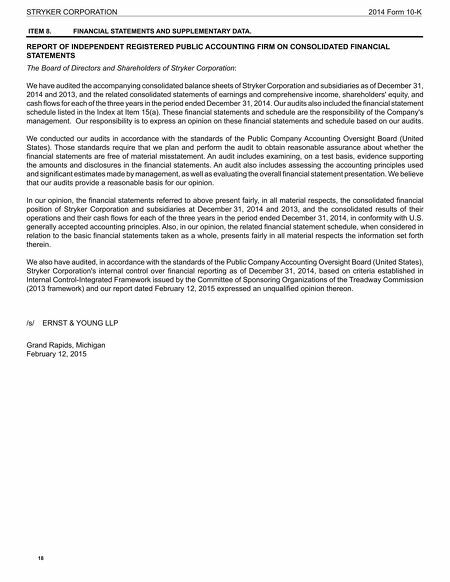 STRYKER CORPORATION 2014 Form 10-K 17 Dollar amounts in millions except per share amounts or as otherwise specified. NEW ACCOUNTING PRONOUNCEMENTS In May 2014 the FASB issued Accounting Standard Update (ASU) No. 2014-09, Revenue from Contracts with Customers, which supersedes and replaces nearly all currently-existing guidance under United States Generally Accepted Accounting Principles related to revenue recognition including related disclosure requirements. This guidance will be effective for us beginning January 1, 2017. We have not yet completed an assessment of the impact that adoption of this guidance will have on our consolidated financial statements. OTHER INFORMATION Hedging and Derivative Financial Instruments We sell our products throughout the world. As a result, our financial results could be significantly affected by factors such as weak economic conditions or changes in foreign currency exchange rates. Our operating results are primarily exposed to changes in exchange rates among the United States dollar; European currencies, in particular the euro, Swiss franc and the British pound; the Japanese yen; the Australian dollar; and the Canadian dollar. We develop and manufacture products in the United States, China, France, Germany, Ireland, Puerto Rico and Switzerland and incur costs in the applicable local currencies. This worldwide deployment of facilities serves to partially mitigate the impact of currency exchange rate changes on our cost of sales. We enter into designated and non-designated forward currency exchange contracts to mitigate the impact of currency fluctuations on transactions denominated in nonfunctional currencies, thereby limiting risk that would otherwise result from changes in exchange rates. These nonfunctional currency exposures principally relate to intercompany receivables and payables arising from intercompany purchases of manufactured products. The periods of the forward currency exchange contracts correspond to the periods of the exposed transactions, with realized gains and losses included in the measurement and recording of transactions denominated in the nonfunctional currencies. All forward currency exchange contracts are recorded at their fair value each period, with resulting gains (losses) for non-designated forward contracts and any ineffectiveness measured on designated forward currency exchange contracts included in our Consolidated Statements of Earnings. For derivative instruments that are designated and qualify as a cash flow hedge, the effective portion of the gain or loss on the derivative is reported as a component of accumulated other comprehensive income, and reclassified into earnings in the same period during which the hedged transaction affects earnings. The estimated fair value of forward currency exchange contracts represents the measurement of the contracts at month-end spot rates as adjusted by current forward points. A hypothetical 10% change in foreign currencies relative to the United States dollar would change the December 31, 2014 fair value by approximately $79. We are exposed to credit loss in the event of nonperformance by counterparties on our outstanding forward currency exchange contracts, but we do not anticipate nonperformance by any of our counterparties. We have certain investments in net assets in international locations that are not hedged. These investments are subject to translation gains and losses due to changes in foreign currency exchange rates. For 2014 the strengthening of foreign currencies relative to the United States dollar increased the value of these investments in net assets and the related foreign currency translation adjustment loss in shareholders' equity by $(440) to $(134), from $306 as of December 31, 2013. ITEM 7A. QUANTITATIVE AND QUALITATIVE DISCLOSURES ABOUT MARKET RISK We consider our material area of market risk exposure to be exchange rate risk. 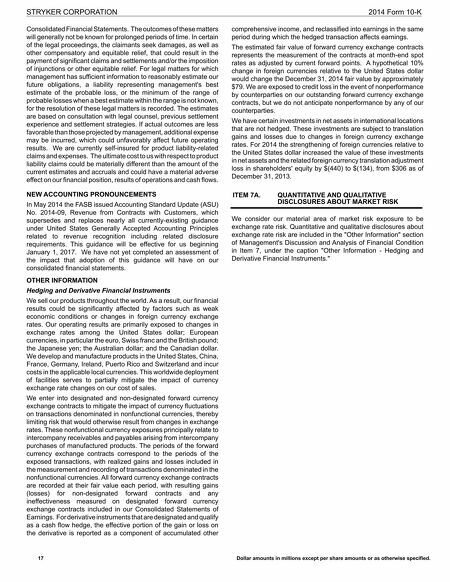 Quantitative and qualitative disclosures about exchange rate risk are included in the "Other Information" section of Management's Discussion and Analysis of Financial Condition in Item 7, under the caption "Other Information - Hedging and Derivative Financial Instruments."